With urban violence and terrorist attacks at an all-time high, families across the US and around the world are looking for new ways to help keep their children and their loved ones safe. After attacks in Brussels, Paris and the shootings in San Bernardino, as well as many others in workplaces, on military posts, in schools and theaters, people need quick, easy-to-use solutions to keep the people they love safe and sound. Every time we watch the news, we can’t help but think that none of the bystanders who were injured, had any idea that they would end up in the hospital that day. And yet here they are, fighting for their lives. In fact, simply living in a metropolitan area, makes people more at risk for allergies, asthma and other medical conditions that make them even more likely to need specialized care in a medical emergency. That’s why putting an ICE Contact on your phone, as well as your spouse’s and children’s phones is so critically important. But as vital as an ICE Contact is, many people simply type in the name of one emergency contact, along with their phone number and stop there. What they don’t realize is that they are missing out on a real opportunity to let their phone do the talking for them in a medical emergency. Especially when lives could be hanging in the balance. Bulk orders & customization available. The ICE My Phone Kit is just one of the books in our new Backup Plan Resource Library. They’re the perfect benefit for your employees and customers. Where Does The Word ICE Go In Your ICE Contact? No, it’s not a silly question. It’s a very smart question, because the ANSWER can mean the difference between whether or not a hospital will be able to find and use your ICE Contact. Why does it matter where you put the word ICE? Because of the way different smartphones sort your contacts. Some phones sort by first name. Others sort by last name. So if you put the first and last name of your ICE Contact into the fields the usual way, the word ICE will be buried inside the contact. Which means that someone looking for ICE might never find it. The good news is, you don’t have to figure it all out for yourself. We’ve done all the work for you! Touch the Contacts Icon on your iPhone to open up your Contacts. 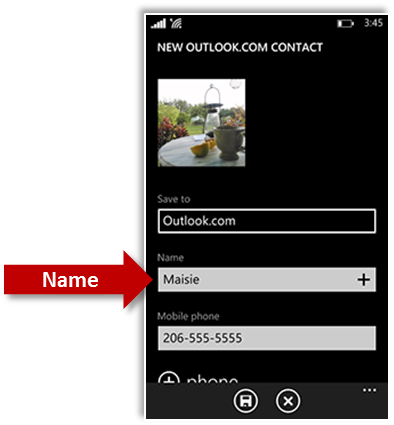 Click on the plus sign + to add a new contact and touch the Name Field. Don’t put the name of your contact in this field, only the word ICE. Now touch the Company Name Field. Here is where you put your contact’s name and his or her relationship to you. For example, John Jones – Husband. That way a doctor or nurse reading it, will know that this contact is your husband. The most important reason we’re setting it up this way is so your ICE Contact can easily be located even if you password lock your phone. How? With Siri. If ICE is the first name in your contact, all a healthcare professional has to do is touch the home button on your locked phone and say “Siri, ICE”. With most iPhone models, Siri will display any ICE Contacts on your phone, even if the phone is locked. Touch the Contacts Icon on your Galaxy to open up your Contacts. Click on the plus sign + to add a new contact and touch the First Name Field. Don’t put the name of your contact in this field, only the word ICE. We’re doing this because your Galaxy sorts contacts by their first name by default and you want your contact to show up as ICE, not as your contact’s actual name. 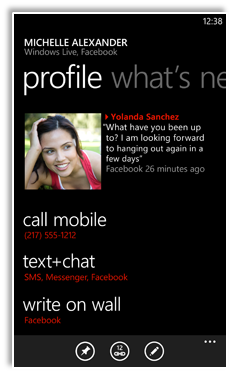 Next, touch the Last Name Field and enter your contact’s full name, ie. John Jones. 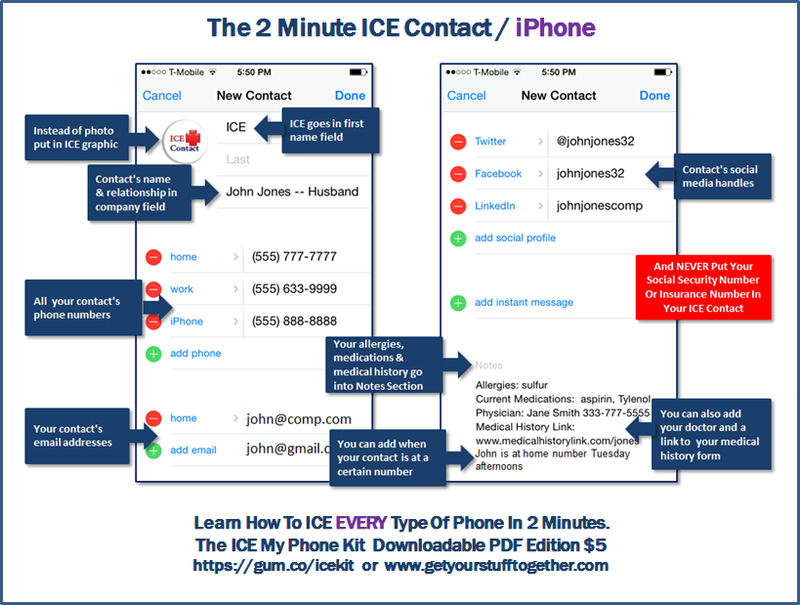 Now when you save the contact, not only will it be alphabetized as ICE, but it will also have your contact’s name right next to it – easy to read and easy to use. Do the same thing when you set up your second ICE contact. The only difference is that you’ll name it ICE2.